Axis Of Oversteer: Ubaldo Sgarzi: Homage to a Gentleman. Ubaldo Sgarzi: Homage to a Gentleman. In late January, Ubaldo Sgarzi was remembered at his funeral service in Bologna. Sgarzi was Ferruccio Lamborghini trusted man from the beginning , coming to the then brand new company in 1964 from a background in racing management. 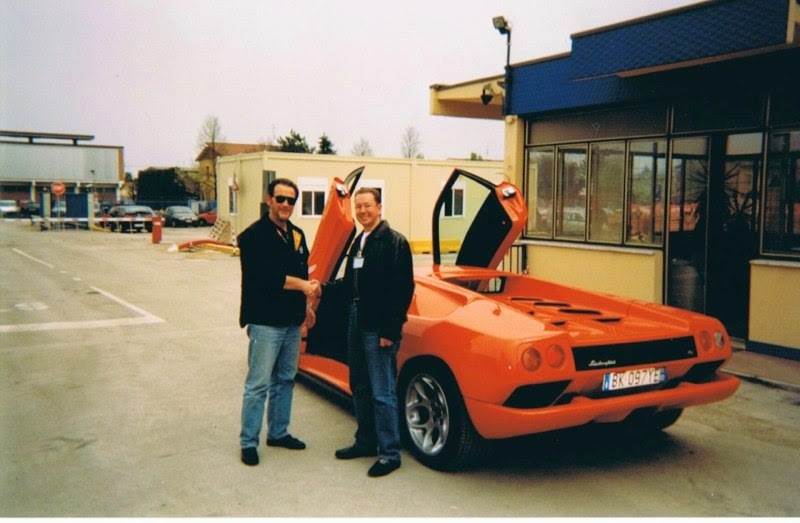 At Lamborghini he became worldwide sales director and did more than anyone to keep the brand alive during the very difficult years of financial hardship, sometimes resorting to very Italian, unorthodox methods to keep customers happy and funds sufficient to keep the doors open. Nobody officially represented the current Lamborghini management at the service but there were a number of notable Lamborghini historical figures: Dallara, Marmiroli, Stanzani and one Horacio Pagani who had started at Lamborghini as an apprentice. Sgarzi did what was necessary to keep Lamborghini afloat but was always the gentleman. 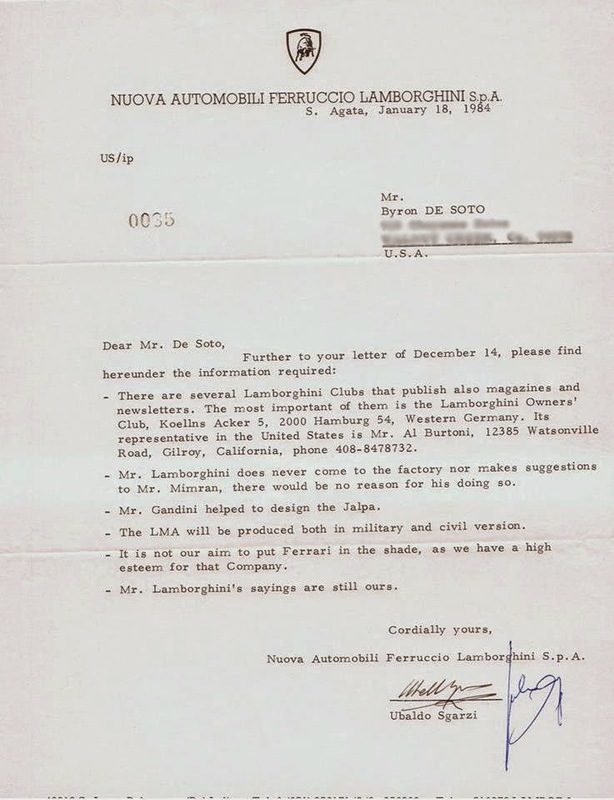 As it happened Sgarzi had a connection with one of our readers, a then 16 year old Californian kid who became possibly the youngest Ferrari and Lamborghini salesman in the world. Byron de Soto shared his story. 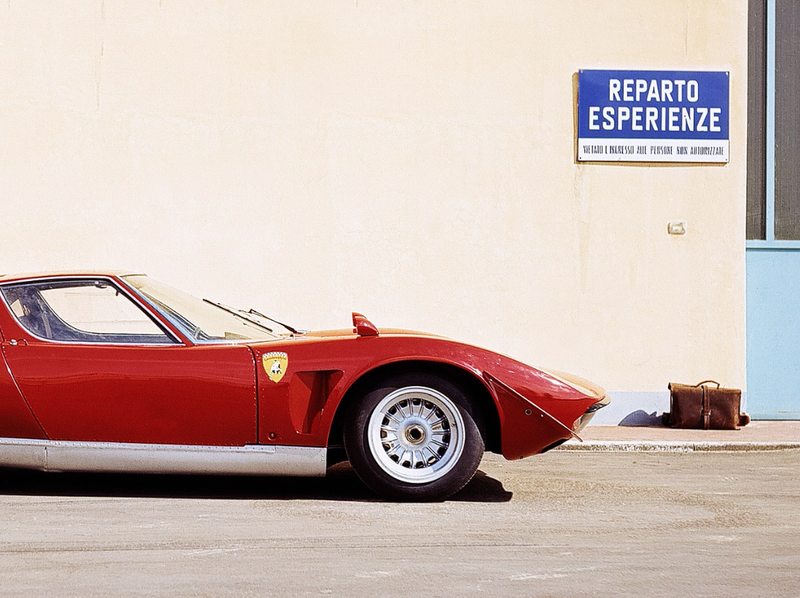 In the mid 1980's I, a very persistent sixteen year old from Northern California, was offered an apprenticeship at the Lamborghini Factory in Italy by Mr. Ubaldo Sgarzi. 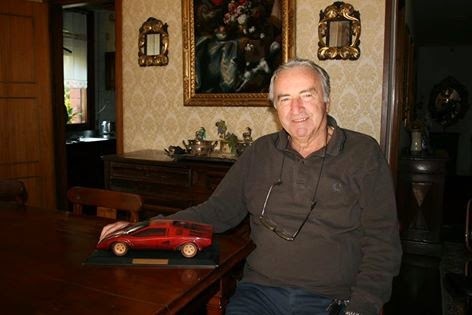 Sgarzi was Lamborghini’s World Wide Sales Manager from 1964 through 1994, the man who kept the factory alive during some of the darkest years in the 1970’s. De Soto looking very Miami Vice! 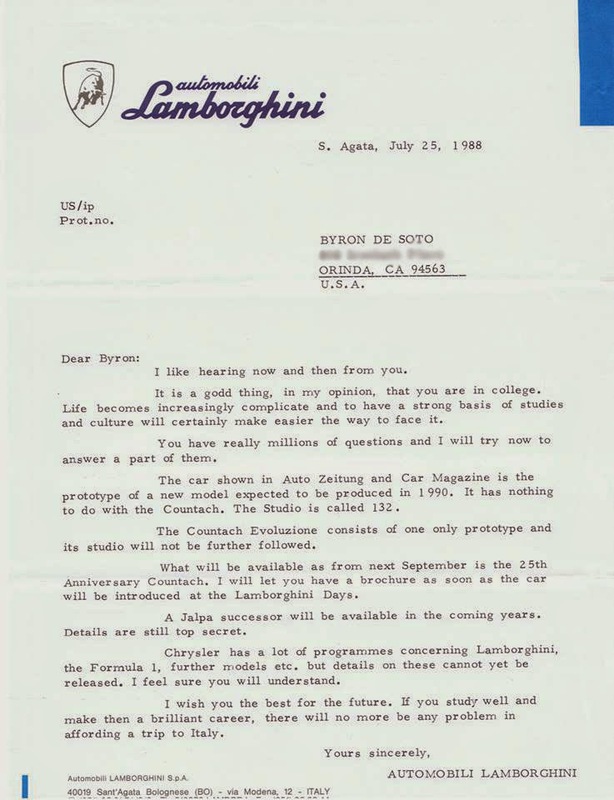 As an young and avid automotive enthusiast, I came to know Ubaldo via air-mail correspondence with the Lamborghini Factory. Starting in 1983; I started writing requesting vehicle specifications, brochures, press items, etc. to fill my insatiable appetite for “informazione automobilistica”. Back in the snail mail days, it took longer but letters postmarked from Italy did come, written by Ubaldo Sgarzi who was always generous and friendly in his replies. 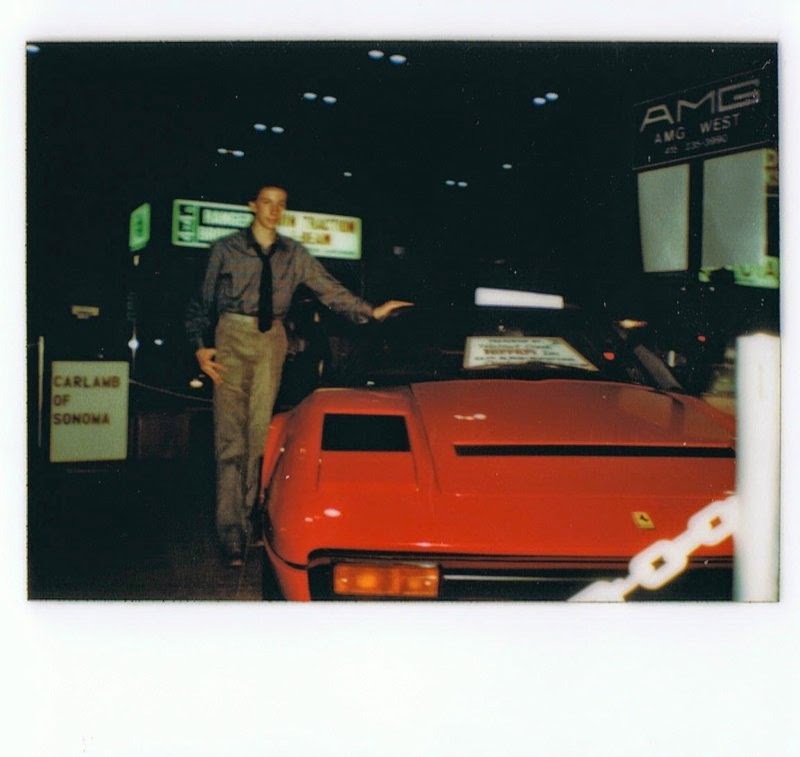 In early 1984, the Dealer gave up its Lamborghini franchise but I still maintained my communications with Ubaldo: letters and phone-calls in my then sketchy, self taught Italian. Sgarzi was unfailingly patient a kind. Later that year I received my vehicle sales license (in California you could get your sales license at the age of 15-1/2 at the time, the same age you could get your driver’s permit!). I became the world’s youngest salesman for Ferrari – working weekends, after school and on summer vacations. Knowing all significant Lamborghini employees started as apprentices, I asked Ubaldo in early 1985 if I could work at the Factory. He replied that if the dealer where I worked could validate my background / character in a formal letter, he would see what he could do. 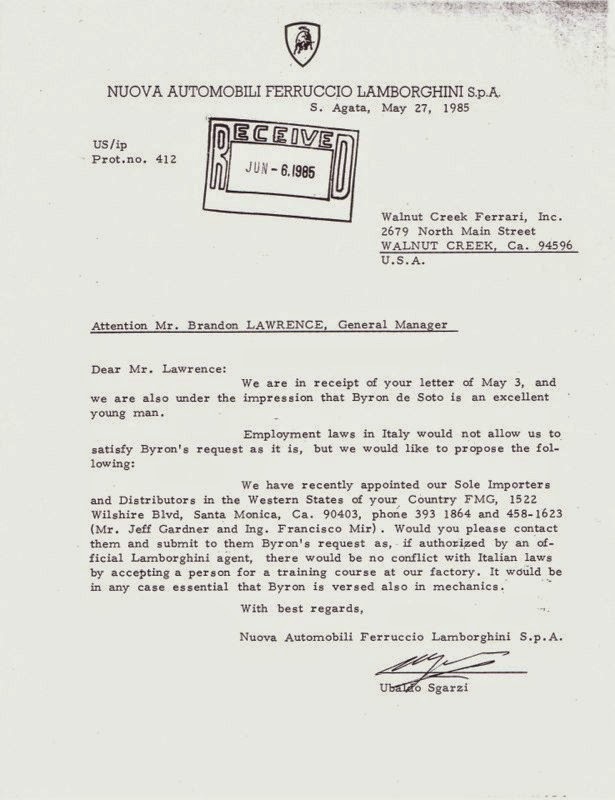 My manager sent Ubaldo said letter, and on June 6th, 1985, we received the reply: I was offered an apprenticeship. Here was a man who put his trust and support behind an unknown American 16-year-old kid, half a world away but my family, much to my protests, could not agree to letting their only son, a minor, move off to the other side of the world “with strangers; without finishing high-school or college”. We kept in frequent touch for the next 7 years: letters (changing from English to Italian), phone calls, and invitations to Lamborghini Celebration Day events, which I was never able to attend due to school schedules and lack of funds. Yet, Ubaldo was always supportive, kind (providing me press-kits, new brochures for new models), and ever interested in my studies, encouraging my progress, the occasional, friendly “hello”, just for good measure; giving me insight to the business and ever the gentleman. 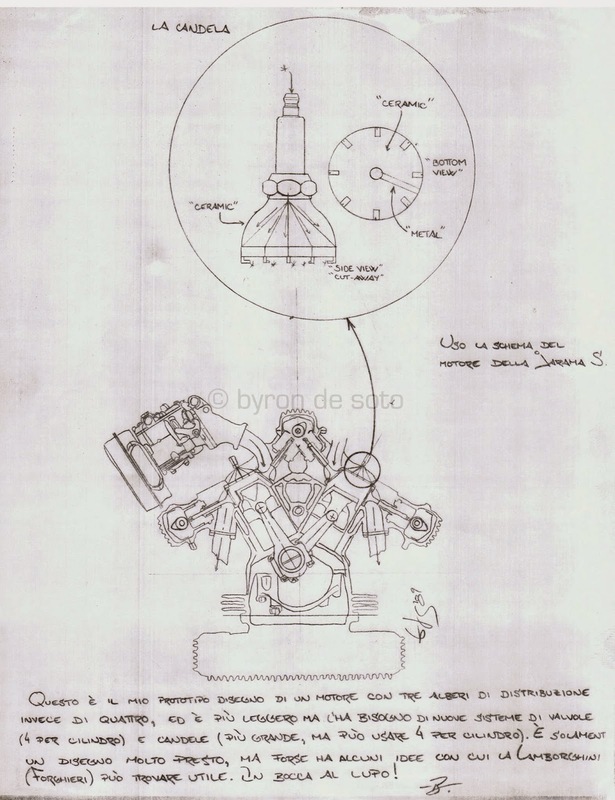 During these high-school and then college days, I studied and honed my automotive body and suspension designs (the core of what was to be the basis of my apprenticeship): sending samples to Ubaldo which he found “carini”… some of the reply letters received were signed by both Ubaldo and the great Giulio Alfieri. 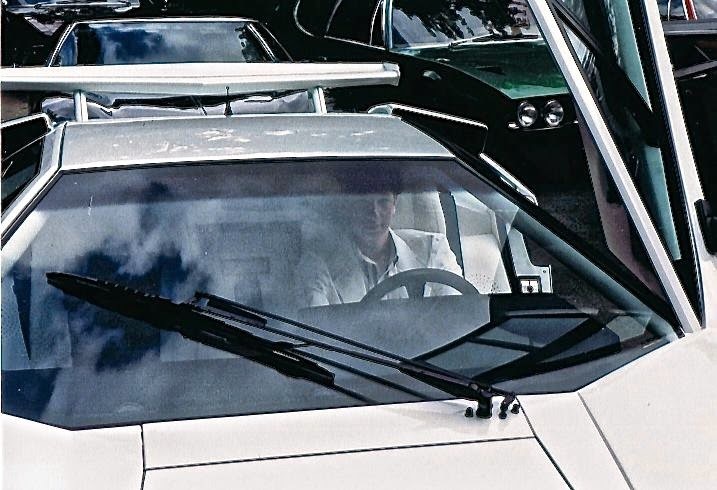 As I came to finish college – with the intent of then finally moving on to Lamborghini -- so came the collapse of the world economy in the early 90’s and with it the automotive collector’s market. Car values dropped exponentially, along with any profit to be made in selling vintage Ferraris with customers not willing to pay for the then new “Luxury Tax” presented by the first Bush's Administration. In this financial crisis, times were tough at Lamborghini too and they were laying off staff. in 1992 Ubaldo let me know that even with my University studies concluded, he could no longer provide me the apprenticeship: I was crestfallen. With the world markets as they were, Chrysler sold Lamborghini to the Indonesian Suharto/Mega-Tech group in 1993; Ubaldo had had enough and retired in 1994. 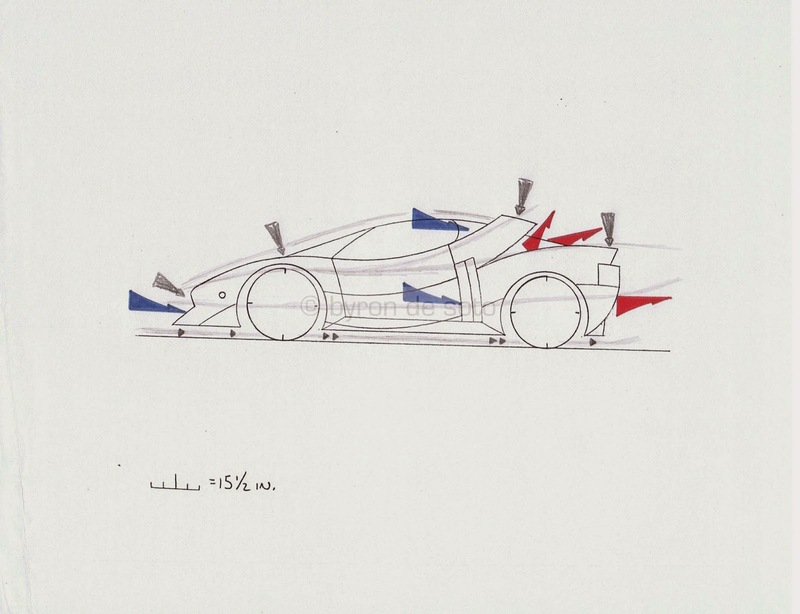 In these pre-internet days, I then lost contact with Ubaldo, not knowing he had moved on to work for one of Lamborghini’s former employees (once an apprentice himself): Horacio Pagani. With IT came more money, more predicable paychecks (no longer on the roller-coaster of sales commissions) so finally in 2000, I had the means for my first trip to Italy. It was to be a significant two week automotive dream: visits to the Ferrari Factory, the Lamborghini Factory where I met Valentino Balboni in person for the first time and was the first American to experience the then brand-new Diablo 6.0. I visited the museum of my idol Tazio Nuvolari, in Mantova and the San Marino Grand Prix where I watched Michael Schumacher’s amazing victory. But the key to this visit was missed: I tried to find Ubaldo and arrange to meet him in person but our timing was not to be. Over the following years, more global responsibilities with my IT work, getting married, buying a house, having dogs, and finally getting into serious driving (tracking my BMW) put a crimp on my keeping in touch with my Ferrari and Lamborghini friends – a fault on my part. My latest effort to re-connect with Sgarzi, going through some of my Pagani contacts, was in September, 2014…but it did not work out. January 28, 2015: Ubaldo at the age of 82, has passed on. After getting the news, I spent the day going through all of our correspondence some of which I'm happy to share here, still wishing I could shake his hand and offer my long overdue, sincere thanks in person.